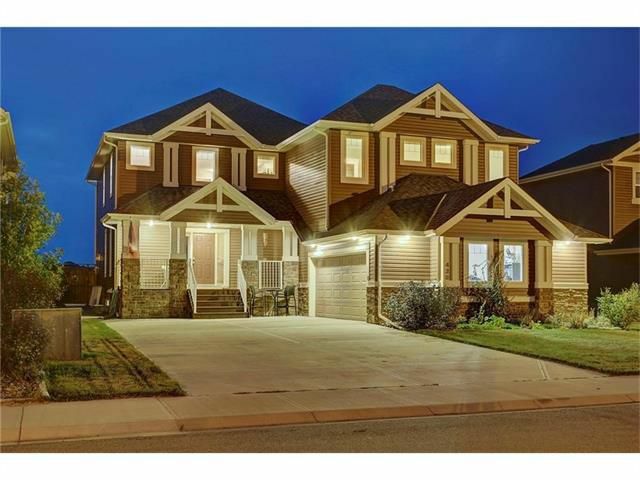 Gorgeous fully finished 2-Storey home is perfectly situated across from the Boulder Creek Golf Course. Large entrance way has ample closet space and is very close to the den which is extremely convenient for a at home office. The kitchen feat. SS appliances, gas stove, granite counters, tiled backsplash, raised eating bar, & corner pantry. Floor-ceiling stone is centred in the living room with a gas fireplace & wall built ins. Laundry room, dining room, 9’ ceilings, & hardwood flooring completes the main floor. Master bedroom has a walk-in closet, & 5 pc en suite with corner soaker tub, dual sinks, & separate glass shower. 3 additional bedrooms with ample closet space share a unique 5 pc bath with privacy doors separating the dual sinks from the shower & toilet. Downstairs offers a fully finished layout with a 2nd kitchen, large family room, & 3 pc bathroom. An oversized DB attached garage has more than enough room for your large vehicles & toys! The beautifully landscaped back yard is fully fenced & features a 2-tiered deck, dog run, & aggregate patio/sidewalk.